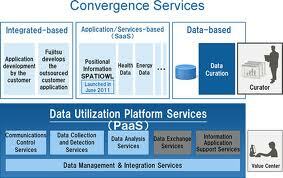 The platform provides an apparatus for the collection and categorization of massive volumes of sensor-driven data. In addition to collecting and categorizing data, Fujitsu’s platform can transmit data to other devices in order to automatically adjust data driven equipment such as devices in a home, automotive, factory or scientific environment. Fujitsu’s platform can apply rules to data derived from sensors to adjust machinic behavior with real-time frequency using an iterative feedback loop. Rule based sensing data decision making may involve equipment in the fields of navigation, robotics or other industries in which real-time decisions depend on a contemporary data store. The platform contains a bevy of business intelligence tools that enable the production of actionable analytics to drive operational decisions. Fujitsu will also be offering a set of “Data Curation Services” that involve professional services and analytic tools that assist customers to tackle their Big Data challenges. Fujitsu failed to elaborate on the underlying technology for either the cloud-based or Big Data components of its Data Utilization Platform Services, but a report in The Register speculates that “Hadoop, the open source MapReduce data muncher and its related Hadoop Distributed File System” constitutes one of the platform’s key technologies. Absent details of its underlying technology, the most notable feature about Fujitsu’s cloud platform for Big Data is its distinct focus on data derived from sensing technologies in fields such as navigation, robotics and meteorology.